The modular valve packs are part of the compression and rebound knobs of the shock and determine the actual valving of the shock. By simply unscrewing the knobs to remove the existing ones and then screwing in new ones, the valve packs can be swapped out in just minutes, with the shocks remaining on the car, to achieve different force curves. The shock remains free from contamination with no interruption to the oil pathways thanks to QuickTune™ Technology. Never before could you change the valving characteristics this much without completely disassembling the shock. All MOD™ Series shocks come equipped with medium (100-650 lbs.) valving that’s well-suited for a variety of racing and driving styles. Racers looking for a higher level of tunability can purchase softer (50-350 lbs.) or firmer (375-1100 lbs.) valve packs depending on the vehicle or current track conditions. Available in rebound or compression, these valve packs are sold in pairs. Additional accessories include a spanner wrench for adjusting the ride height, a flat panel or arm for mounting the shock’s external canister, and extended eyelets to increase the length of the shock. 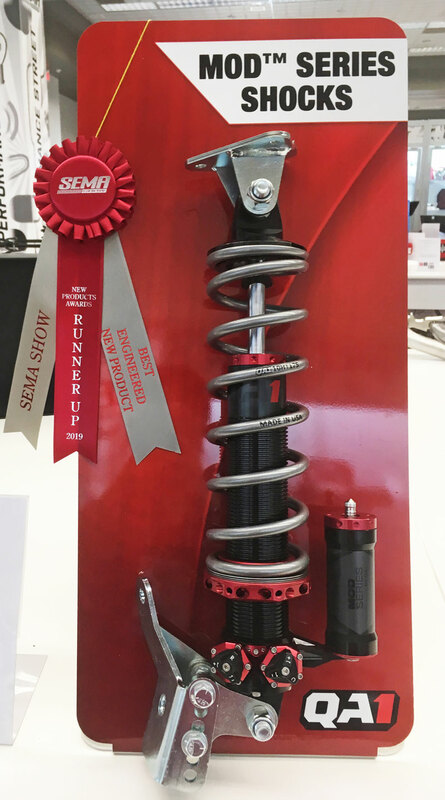 Like all QA1 shocks, the MOD™ Series shock is 100% dyno tested and serialized and proudly made in QA1’s Lakeville, Minnesota facility.